Carrier screening is an important step toward informed family planning. Screening enables prospective parents to understand the risk of passing on an inherited genetic condition to their children. Carrier screening before pregnancy is most advantageous as it enables a couple to do research, seek resources, and make an informed decision with the greatest number of reproductive options. NTSAD strongly encourages you to contact a geneticist or genetic counselor prior to planning a pregnancy to discuss your options. Carrier screening is especially important for people of Ashkenazi Jewish (Eastern European) ancestry as certain diseases such as Tay-Sachs, Gaucher disease, and Familial Dysautonomia occur more frequently in this population. Tay-Sachs disease also occurs more frequently in individuals from French Canadian, Pennsylvania Dutch, Irish, and Cajun backgrounds. The carrier rate for Tay-Sachs disease among Ashkenazi Jews and French Canadians is about 1/27. Genetic counseling is strongly recommended alongside carrier screening. A genetic counselor can explain testing options, interpret test results, facilitate decision making, and assist with insurance coverage. For more information about how to contact a genetic counselor, visit the Genetic Counseling tab. All of our genes come in pairs, one copy inherited from each of our parents. A carrier of a recessive disease has one working copy and one altered copy of a specific gene. A change in a gene that causes a genetic disease is called a “mutation”. An autosomal recessive condition like Tay-Sachs happens when a child inherits two altered or mutated HEXA genes, one from each parent. 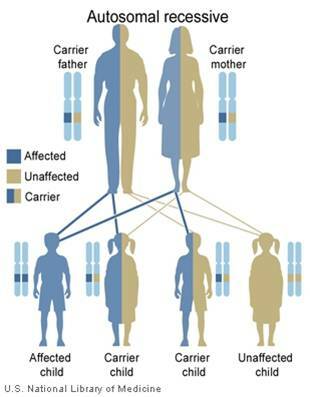 Both parents must be carriers of a mutation in the same gene in order for any of their children to be affected. A carrier is not expected to experience any adverse health effects. The gene change may be passed through many generations without anyone knowing until a child is diagnosed with a genetic condition or the genetic change is detected through carrier screening. To learn more, click About Inheritance.